Hello friends and welcome to the Spring Fling Instagram Hop in celebration of National Craft Month! Make sure to keep reading for all the awesome details AND for you chance to win a Spoonful of Soul Collection Pack from Jillibean Soup! Some of your favorite crafty folks (including myself) are throwing a party with a two week celebratory Instagram Hop. Over on Instagram one lucky person will win a $50 online gift certificate to shop at Scrapbook.com - who is sponsoring this wonderful prize. To qualify, head on over to my IG account and hop along! Hello friends and welcome! Today I'm excited to share with you a card I created using some fabulous new products from Ranger Ink. A couple of weeks ago, they contacted me and asked if I would like to try out some of the new products they released at Creativation. Of course I said yes and I'm still quite honored they contacted me to do this. For the project I'm sharing today, I played with some of their new Liquid Pearls and Embossing Powders. I'll be honest, I've never used Liquid Pearls. But...I think I may have found a fun new product to play with! I love the dimension it added to my project. Wow, this blog has been silent for a bit hasn't it?! It's not for lack of creating on my part. Rest assured. I just needed a break from some of the "work" involved with creating, and blogging was one of those things. You may (or may not) have noticed that I stepped down from some of my design teams. This was purely based on a need for a break and realizing that I needed more time for me to do my own creating. Creating without deadlines and work. See...it was starting to become work and I was finding that I just didn't have the time for all of it. And...I was starting to not enjoy the creative process. I knew I had to make some tough decisions. In the end though, it was the right thing to do. Since the beginning of the year, I've had more time for me and more time to create just for me. Yes, I know that sounds a bit selfish. It's not that I don't want to share it with anyone. I plan on doing that for sure. It's more the type of creating that doesn't have guidelines, product specifications, deadlines, etc. My soul needed more creating just for me time and I'm so glad to be finally doing just that! It has brought fresh eyes to what I'm creating for my design teams and time for me to just play! Along with this change in my life, I've also got a bit of confession to share. During the time I was making these decisions I realized something. As much as I tend toward the clean and graphic style, I also really love the grungy and distressed. I love getting my hand dirty with ink and paint and gesso! 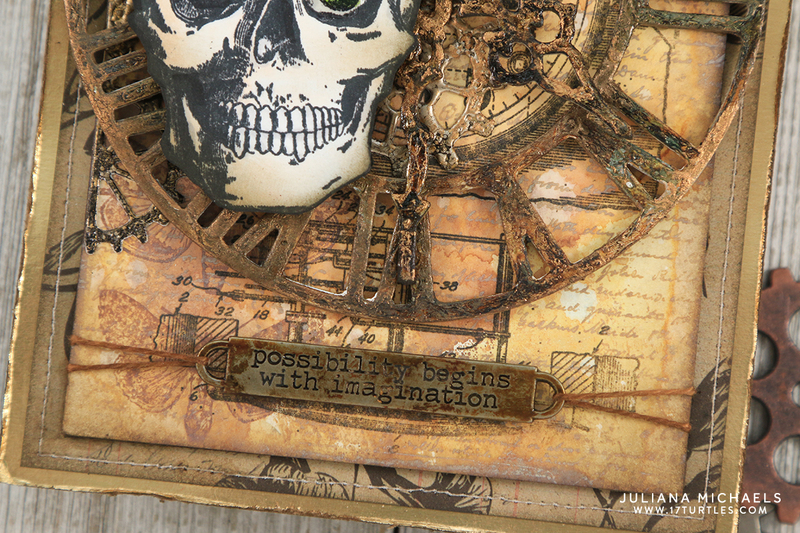 I've also come to admit that I'm a Tim Holtz crazy fan! Yes, I've got my fair share of Distress Inks and such, but I'm talking about doing more of the grungy, mixed media style that his products can lend themselves toward. I've secretly hoarded tons of his Halloween and Christmas products with dreams of creating vintage and distressed style vignettes and projects. However, when you don't have the time to do anything but your design team assignments, it's difficult to fit in anything extra. And then of course self doubt would set in and I'd wonder about whether or not people would like to see mixed media projects from me when they are used to what I normally share. Yes, I'll admit that thought has crept into my head more than once. It still does, even as I'm writing this post. So, yeah, I've rarely made the time to do this sort of creating. And maybe those doubts added to my excuses to not do it. A few crafting friends have seen me play with this stuff, but they are the very few who have actually seen what I've made. And truth be told...I've not really made that much until recently. When I decided to step down from some of my teams I gave myself permission to play and create what I wanted to. 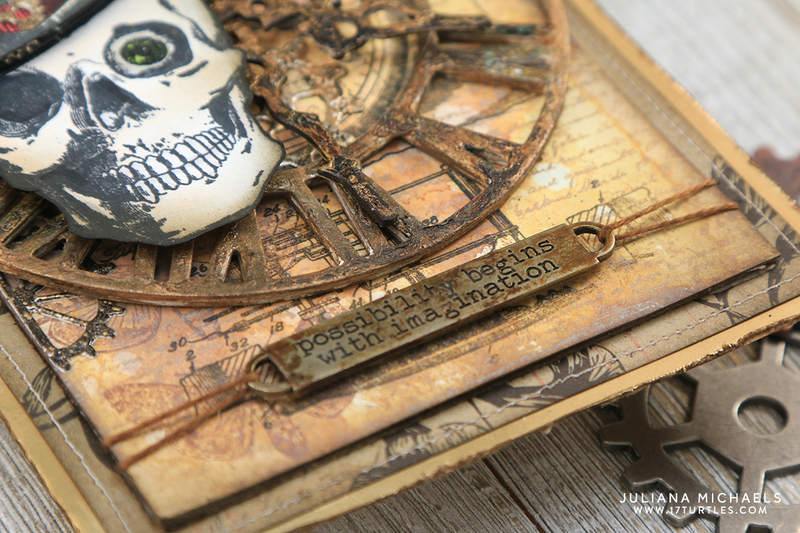 In January, I began playing with some of my Tim Holtz products and of course I also added to my stash of stuff as well. I needed to fuel this creative fire within me and his products spoke to me in a way I've not had in a long time. I actually day dreamed about what I wanted to create. This is something I used to do years ago, when I spent most of my creative time scrapbooking. I have missed that type of creating. Ideas popping into your head when you aren't even creating. Usually, I've had to sit and play with the products for the ideas to come to me. I now know that this was because my creative brain had been stifled by my own doing. I've learned a valuable lesson when it comes to creating for others. Too much of good thing can be a bad thing. So from here on out, I'll be focusing on my 2 design teams and then spending the rest of my creative time doing things just for me. Yes, I'm open to doing guest design spots and such. In fact I'll be doing one here very shortly for an amazing company and I can't wait to share about it with you! But in the end, the focus will be on creating just for me. Have you ever felt this way? Join me on IG and share what you create just for you using the #creatingjustforme. It would be great to know that I'm not alone and....that it's OK to step outside your known style and spread your wings and just create! It really is all about finding your creative joy! Speaking of "creating just for me" here's a project I recently created just for me. It's super grungy and distressed and all things mixed media. I'm going to be putting this little "piece of art" in a prominent place in my craft room. I want it to be a reminder of what I've shared today and learned about myself recently. 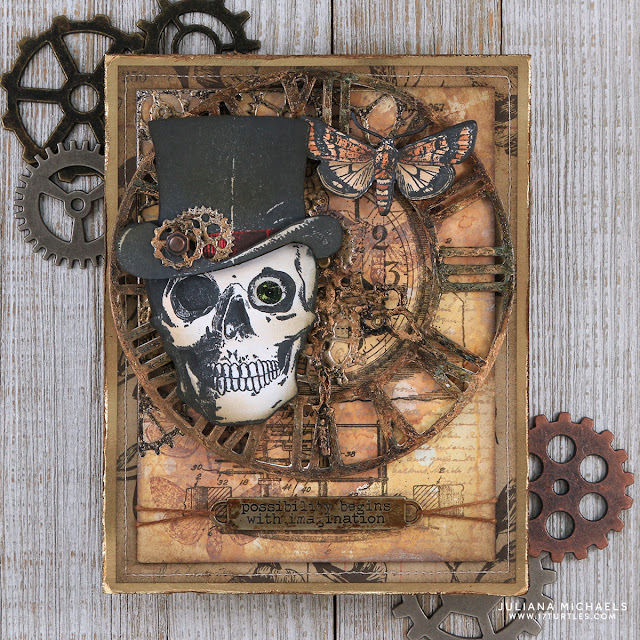 To create this mixed media piece I used some fabulous Tim Holtz products of course. The background was creating using Distress Oxide Ink in Vintage Photo, Antique Linen and Brushed Corduroy. I then stamped on it using the following stamp sets by Stampers Anonymous: Inventor 1 and Entomology. I stamped them with a mix of Distress Ink and Archival Ink. For the focal stamping, I stamped Mr. Bones and a moth from the Entomology set using Memento Ink in Tuxedo Black and I colored them in with my Copic Markers. 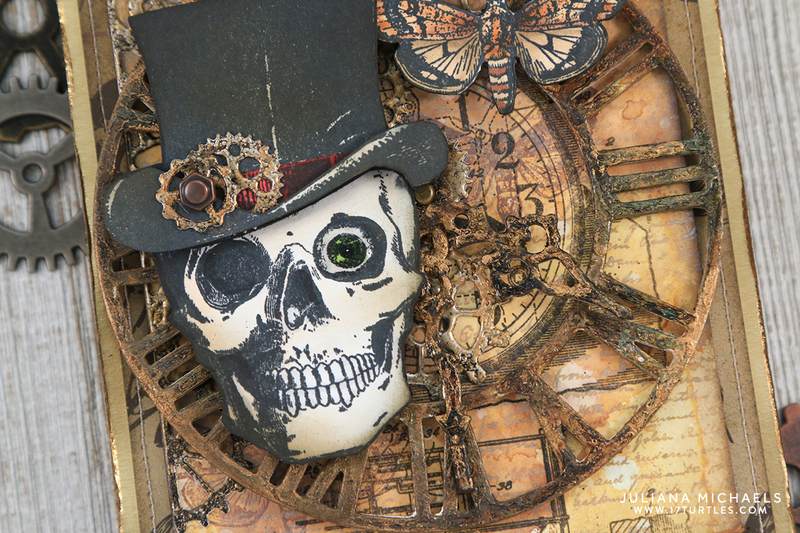 Behind Mr. Bones you'll find some die cutting that includes the Gearhead Thinlit Dies and Timekeeper Bigz Die. I used Prima Finnabair Art Alchemy Metallique Wax in several different colors to give some color and shine to these pieces. 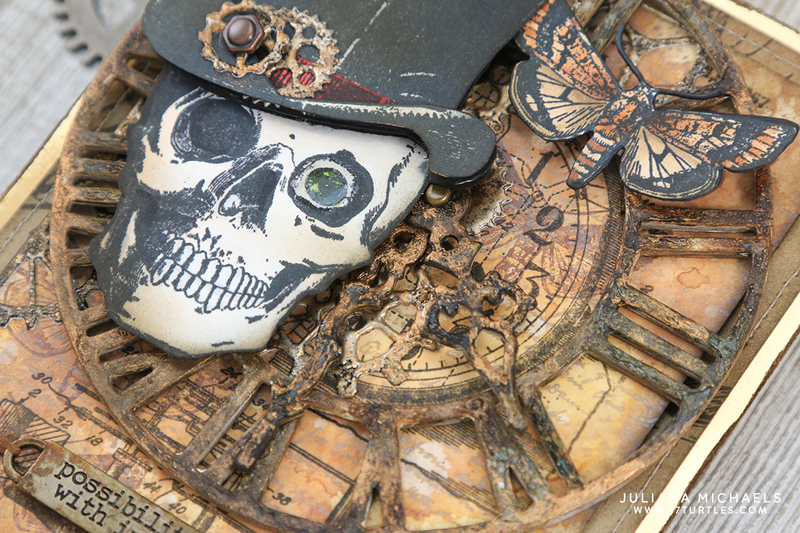 I also used gesso, crackle paint and Alcohol Inks on the Timekeeper piece to make it look like a piece of metal. The phrase on the piece is one of the Tim Holtz Ideology Word Bands that I grunged up with some Alcohol Inks. I then tied it in place with a piece of string that I colored with some Distress Stain. 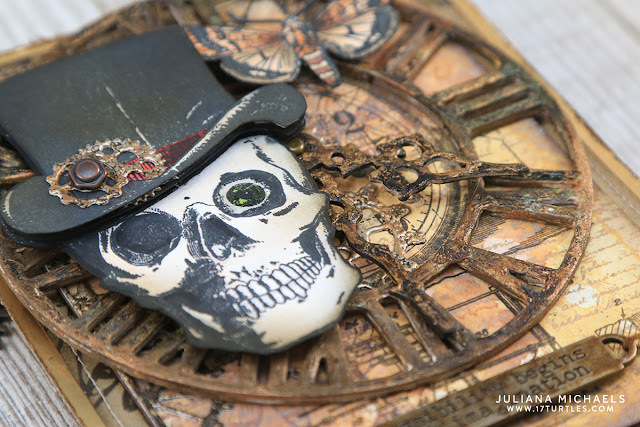 To finish it off, I layered the piece onto some patterned paper from the most recent Tim Holtz Halloween Paper Pad and then finally onto a piece of gold paper from the 8x8 Kraft Stock Metallic Paper Pad. I hope you aren't frightened away with all that I've shared today. But if you are I completely understand. This new style I'll be sharing here and there may not be for you. This is for me though and I'm so happy to be finding my creative joy again. That alone means so very much to me. And maybe this will inspire you to search for your creative joy and starting creating just for you! Thanks so much for stopping by today and for taking the time to read through this crazy long post. PS...If you're interested in more details on how I created this piece, just let me know in the comments below or you can message me on IG at julianamichaels.